Use the drag-and-drop dashboard builder. Set up a dynamic dashboard. Add a report chart to a report. Add an embedded chart to a record page layout. Great reports help you make decisions and take action. But sometimes you need to get your insights at-a-glance, especially depending on your audience and the device being used. Enter the dashboard, your utility for summarizing and displaying your Salesforce data in a graphical layout. Salesforce dashboards allow you to present multiple reports side-by-side using dashboard components on a single dashboard page layout. Dashboard components come in a variety of chart types, and you can customize how data is grouped, summarized, and displayed for each component. The drag-and-drop dashboard builder is an intuitive interface for building dashboards from source reports or Visualforce pages you’ve created in Salesforce. 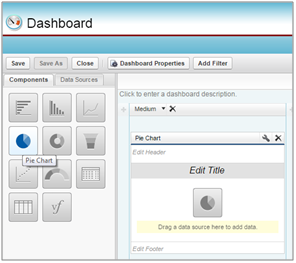 In addition to dashboards, you also have options to add charts to reports and record page layouts. Read on to learn about your options for visualizing your data with report charts and dashboard components. Meet the drag-and-drop dashboard builder, your way to visualize your data for easy consumption at-a-glance. To access the dashboard builder, click on the Reports tab and click New Dashboard. Check out this short video introducing you to the drag-and-drop dashboard builder. Get started with building a dashboard by dragging a component  into the preview pane . Each component will show your report data in a different visual chart display. Once you’ve dragged in a component, click on the Data Sources tab  and select your report. Drag that report onto the component in the preview pane. It will take a moment for the dashboard component to generate the chart. Then voila! Your dashboard component will show your data. The data that is displayed varies based on the running user  . The user’s name entered here will determine what data you see on the overall dashboard. Visualforce Page Use a Visualforce page when you want to create a custom component or show information not available in another component type. Finally, when selecting a report for use in a dashboard component, all report formats may be used, however, Tabular reports must be limited by row to be used in a dashboard. Let’s walk through creating a dashboard. First, you’ll need to create the source report we’ll use in the dashboard. In this example, we’ll make a simple Leads report. Click New Report and select Leads as the report type. Select All Leads for Show. Select Create Date for Date Field. Select All Time for Range. Click Tabular Format and select Summary. Drag Lead Source from the Fields pane to the Preview pane into the Drop a field here to create a grouping section. The following columns should already be included in your report: Lead Owner, First Name, Last Name, Title, Company/Account, Rating, Street, Email. Click Save As and name your report Leads by Lead Source and accept the auto-generated unique name. Choose the My Personal Reports folder. Click Save & Return to Report. From the Components tab, drag and drop the pie chart component onto the preview pane. 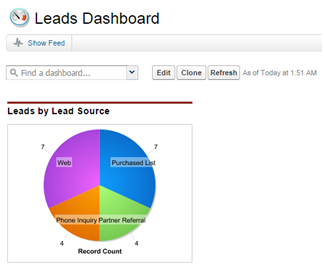 Search for your leads by Lead Source report and drag and drop it onto the pie chart component. Give the chart a moment to generate. Once it generates, click in the Edit Header section and type in Leads by Lead Source. Optionally enter a title and footer. Click on the wrench icon in the upper right corner of the dashboard component. Select Sort Rows By and choose Label Descending. This will place the values on the component in alphabetical order. Select Legend Position and choose On Chart. Click Save and name the dashboard Leads Dashboard and accept the auto-generated unique name. Enter a description and choose the My Personal Custom Dashboards folder. When you’re just getting started with building dashboards, consider downloading one of the sample CRM dashboards from the AppExchange to use as a sample. Visit this help topic for more details. Dashboard filters make it easy to provide different combinations of data from a single dashboard. You don’t need separate dashboards for different sets of users — just give each group a filter that makes sense for them. For example, on a sales dashboard, you might gather several stages of Opportunities into a group called “Early.” This lets users quickly filter the dashboard to show only data relevant to deals that are in the early stages of development. Let’s walk through creating a dashboard filter, using our Leads Dashboard we just created. Now let’s create a filter where we bucket together values from the Status field. 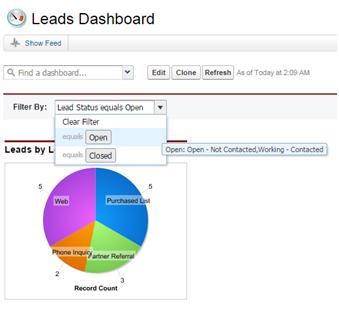 Click Edit on your Leads Dashboard, then click Add Filter. Select the Lead Status field to filter on from the Field drop-down. If you have more than one component on the dashboard, the drop-down will show fields that can be used to filter all components. For our example, we only have one component on the dashboard. Give your filter a display label to identify it. If your filter has many equivalent fields, we recommend using a label that works for all components. In this example, we’re using the name Lead Status. Under Filter Options, select an operator and provide one or more values to filter by. Use the Group Name field to give your filter a name. For our example, we’re creating two groups: Open and Closed. Click OK, then Close and Save and Close to return to your dashboard. Now you can filter your components on Lead Status. Nice one! Now you’ve got a filter on your Leads Dashboard for Lead Status. If you ever want to modify or delete an existing filter, from the filter drop-down, just select Edit Filter or Remove Filter. 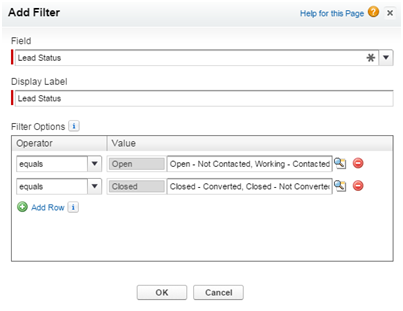 Filters can’t be added to dashboards that contain Visualforce components. It’s not possible to filter on bucket fields. 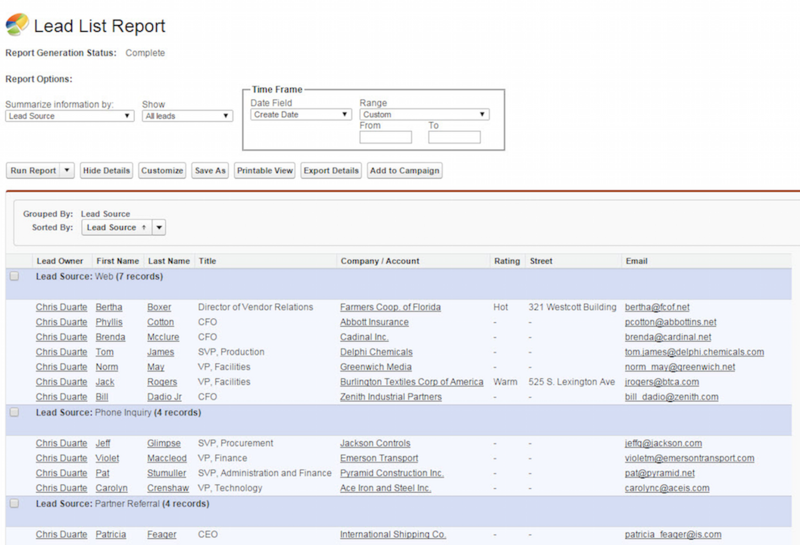 However, it is possible to use a report filtered on a bucket field on the dashboard page. Filters aren’t applied when you schedule or email a dashboard. You can’t filter data on a joined report in dashboard view or add a filter to a dashboard that only has joined reports. Sales reps should only see their own data; managers should only see data for the reps they manage; and the VP should see data across the entire team. In this scenario, you'd typically have to create 45 different dashboards—one for every single person. You'd also have to create multiple folders to manage access rights. With dynamic dashboards, you can create just two dashboards and store them in a single folder. Optionally, create filters that let viewers further refine their dashboard views. For example, create a filter on key accounts to let viewers focus on bookings, activities, and competitive threats for each account. 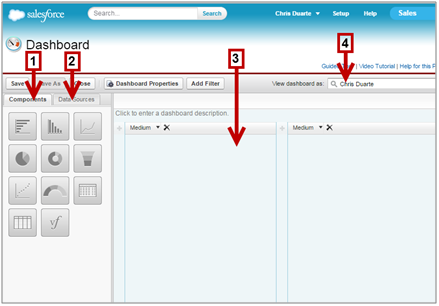 You can create up to three filters for each dynamic dashboard. Filtering dynamic dashboards gives administrators additional flexibility in creating dashboards. For example, you can create an organization-wide sales scorecard that contains sales rep and product filters. This allows individual sales managers to view their reps’ performance collectively as well as individually. It also lets them view sales by product to understand which products specific reps are or aren’t selling. And as mentioned in our real-world example, managers with the “View My Team's Dashboards” or “View All Data” permission can set an option to preview the dashboard from the point of view of users under them in the role hierarchy. Click View dashboard as drop-down button next to the View dashboard as field. Select Run as logged-in user. Optionally, select Let authorized users change running user to enable those with permission to change the running user on the dashboard view page. Users with “View My Team's Dashboards” can view the dashboard as any user below them in the role hierarchy. Users with “View All Data” can edit the dashboard and view it as any user in their organization. In the View dashboard as field, enter a running user. Set the appropriate Show option on the report run page. For example, if you choose “My Team's Opportunities,” each dynamic dashboard viewer can see all opportunities for the team. Open a report in report builder. Click Add Chart in report builder. For existing charts, click Edit Chart. Enter the appropriate settings on the Chart Data tab for the chart type you selected. Enter the appropriate settings on the Formatting tab. Presto! You’ve just added a report chart to your report. Your report must have at least one grouping before you can add a chart. 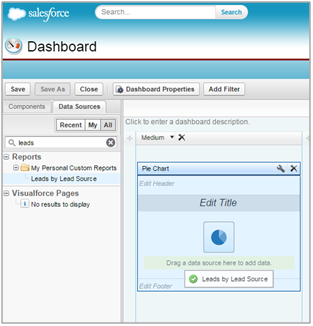 Since we’re putting some charts in Salesforce, why not embed them in your object records? Embedded charts allow you to add up to 2 charts on a single page layout. Here’s an example. Additional limits apply, see this help topic for more details. Its source report is in a folder that’s shared with users who need access. Reports in personal report folders are unavailable to add to a page. The source report format is summary or matrix. The source report has a chart. Go to the page layout editor for the object you’re adding a chart to. In this example, I’m using Cases. For a standard object, from Setup, click Customize | Object | Page Layouts. For a custom object, from Setup, enter Objects in the Quick Find box, then select Objects, then choose the object. For an external object, from Setup, enter External Objects in the Quick Find box, then select External Objects. Select an external object in the list. Click Edit next to the page layout. In the Quick Find box, type the name of the report and click the Quick Find icon to find and select the report chart. You can browse up to 200 recently viewed reports by chart type in the Report Charts palette. Drag the chart to a new or existing section of the layout. Click the Wrench icon on the chart to customize it. Well done! You’ve just added a report chart to a page layout.